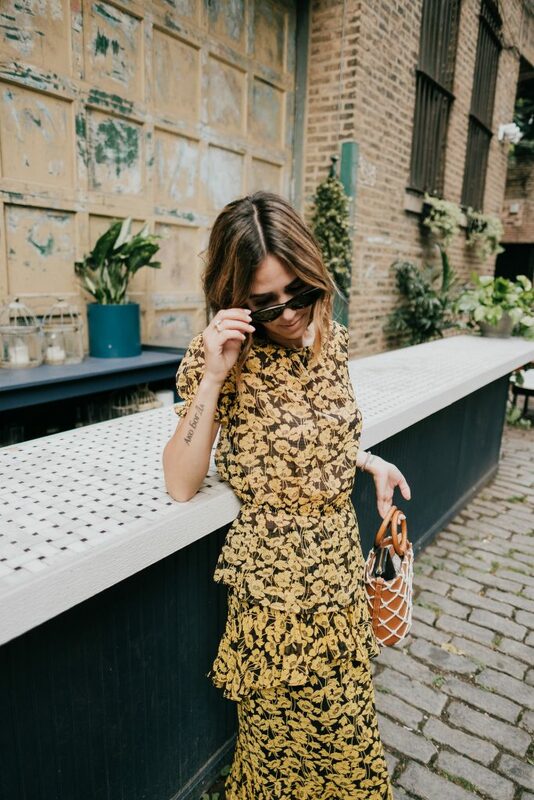 This fall I’ve been REALLY drawn to darker floral prints and monochromatic pieces – so when I saw this monochromatic floral printed set I just about screamed! As you all know, the collaboration between Who What Wear and Target has been my ALL time favorite collection for so many reason! I love the accessibility and constantly revolving pieces – every few weeks there is something new! This floral printed set is one for the books and will be in my closet for some time! Floral Printed Top // Now this top is slightly sheer, but as you can see in the photos, I didn’t wear a cami underneath, but a black bra for some slight edge! Floral Printed Tiered Skirt // This tiered skirt is an absolute dream! This is one of those pieces that you will be able to style several different ways with other pieces from your closet! Gucci Mules // You all know that these have been my favorite shoes of the spring / summer and I will likely not be putting them away for fall! Mango Net Bag // A great bag that you can take from summer to fall in minutes! For more summer to fall type bags, click here for my post on my favorite bags from Amazon. Cat Eye Sunglasses // A classic pair of sunglasses that you just can’t go wrong with! There is nothing better when you find a few pieces that are interchangeable with other pieces in your closet! I love how you can style this blouse with a pair of denim or black leather pants / mini skirt. This tiered skirt has so much versatility – dress it up with sandals or down with sneakers!